There's nothing subtle about a new Iron Mask album. If you want 'true' metal, with epic power and melody in the arrangements, and driven by neo-classical guitar, then the fourth project by Belgium guitarist Dushan Petrossi is your thing. 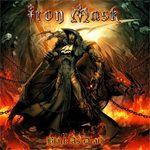 Above, Iron Mask: somebody needs to get the band some beers. There, I've basically defined the essence of this album. While a platform for Petrossi's Yngwie-style fret work, Iron Mask isn't solely about him. The songs, as expected, are well-rounded with singular strength of combining notable melody with heaviness, power and, sometimes, speed. Toss in the excellent rhythm section, touch of keyboards, and impressive vocals of Marc Boals (Malmsteen, Royal Hunt, Ring of Fire, et al), a natural voice for this genre, and you have an impressive outing. There's a good breadth of heavy metal. There's the more speedy power metal of Feel the Fire and Blizzard of Doom to more traditional heavy metal like Black as Death or Genghis Khan. That last song, as does God Punishes I Kill, offers some large choral vocal arrangements (thanks to Oliver Hartmann), a very eloquent touch. Then there's the very catchy melodic metal of Broken Hero or Evil Strikes in Silence. A more subtle, tempered, piece comes in the metal ballad Magic Sky Kingdom which features Goran Edman (also Malmsteen, Brazen Abbot, Vindictiv, Time Requiem, et al). As with previous albums, on Black As Death, Dushan Petrossi and Iron Mask deliver strong, entertaining and, frankly some of the better melodic power metal going these days.